The system simply and easily delivers nitrogen gas for foaming adhesives/sealants or for creating nitrogen blankets. The Nordson Corporation (Nasdaq: NDSN) introduces a nitrogen generation system that creates a continuous, uninterrupted supply of 95 to 99.5 percent pure nitrogen gas. As a replacement for cumbersome, expensive nitrogen gas cylinders, the nitrogen generation system enhances operation of many Nordson adhesive dispensing systems. The inert nitrogen gas can be used with Nordson foaming systems to produce closed cell foam that improves physical properties and reduces volume of adhesives and sealants. The nitrogen gas can also be used with most Nordson tank melters or extruders to create a nitrogen blanket to preserve reactive material integrity. As a self-contained, wall-mount system, the Nordson nitrogen generator installs easily without electrical connections. And, the absence of moving parts simplifies maintenance. A two-stage filter process removes debris and moisture from supply air. The clean, dry air then passes through a special membrane technology that vents unwanted gases while allowing 95 to 99.5 percent pure nitrogen gas to pass through the “gas out” port. Customarily, high-pressure gas cylinders have been used in applications where nitrogen gas is needed. These must be closely monitored to avoid running out of gas which results in interruption of production processes and requires maintenance personnel. A continuous, in-line nitrogen gas supply in place of traditional high-pressure nitrogen gas cylinders eliminates ongoing maintenance and procurement expenses while simplifying operations. The Nordson nitrogen generation system can be used with nearly any Nordson tank melter, particularly the newly-released MiniPUR™ PUR melter system. The nitrogen gas creates and maintains a nitrogen blanket to keep oxygen/air/moisture away from reactive adhesives in the tank. This blanket helps maintain adhesive bonding integrity, preclude char formation, and prevent premature curing of moisture-cure adhesives. The nitrogen generation system can be used with Nordson foaming systems, such as SureFoam™ dispense systems, to generate a closed cell foam with adhesive and sealant materials. As nitrogen gas is truly inert and creates small, consistent bubbles, it is ideally suited for use in foaming processes for applications such as gasketing. Foamed adhesives and sealants enjoy broad use in a range of product assembly applications including woodworking, filter and automotive manufacturing. Use of reactive hot melt adhesives, particularly polyurethane (PUR), is common in product assembly applications such as woodworking, as well as in bookbinding spine glue applications. 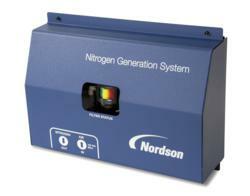 For more information about Nordson’s nitrogen generation system or any of our manufacturing solutions, contact Nordson toll-free at (800) 683-2314, fax toll-free (866) 667-3329 or visit online at nordson.com/hotmelt. Nordson Corporation is one of the world’s leading producers of precision dispensing equipment that applies adhesives, sealants, coatings and other materials to a broad range of consumer and industrial products during manufacturing operations. The company also manufactures equipment used in the testing and inspection of electronic components as well as technology-based systems for curing and surface treatment processes. Headquartered in Westlake, Ohio, Nordson has direct operations and sales support offices in more than 30 countries. For more information on Nordson, visit nordson.com or follow us on Twitter/Nordson_Corp or Facebook/Nordson.